英文原文：Herper, Matthew："How Two Guys From Queens Are Changing Drug Discovery". 美国Forbes 杂志(August 14, 2013). 英文原文：Herper, Matthew："How Two Guys From Queens Are Changing Drug Discovery". Forbes (August14, 2013). 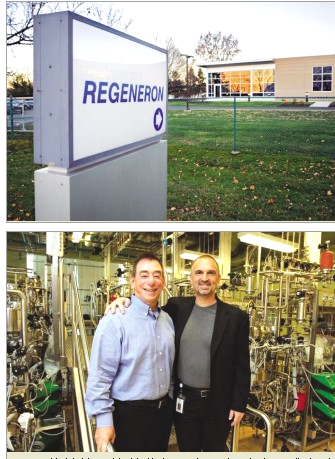 RegeneronPharmaceuticals, Inc. is a biotechnology companyheadquartered in Eastview, near Tarrytown, New York. The company was foundedin 1988. Originally focused on neurotrophic factors and their regenerativecapabilities (thus the name), it branched out into the study of both cytokineand tyrosine kinase receptors. Regeneron has developed aflibercept, a VEGFinhibitor, andrilonacept, aninterleukin-1 blocker. VEGF is aprotein that normally stimulates the growth of blood vessels, andinterleukin-1 is a protein that is normally involvedin inflammation. On March 26, 2012 Bloomberg announced that SanofiandRegeneron are in development with a new cholesteroldrug which will help reduce cholesterol up to 72% more than the leading brands.The new drug targets the PCSK9 gene. In July 2015, the company announced a newglobal collaboration with Sanofi todiscover, develop, and commercialise new immuno-oncology drugs, which couldgenerate more than $2 billion for Regeneron, with $640 million upfront, $750million for proof of concept data and $650 million from the development of REGN2810. REGN2810 was later named cemiplimab. ARCALYST (rilonacept) for specific, rare autoinflammatory conditions. Approved by the FDA in February 2008. EYLEA (afliberceptinjection) Approved by the U.S. Food and DrugAdministration (FDA) in November 2011. EYLEAdeveloped to treat a common cause of blindness in the elderly. ZALTRAP (afliberceptinjection) for metastatic colorectal cancer: Approvedby the FDA in August 2012. DUPIXENT (Dupilumabinjection) is for the treatment of adult patientsatopic dermatitis. Approved by FDA on 28 March 2017. Trap Fusion Proteins: Regeneron’snovel and patented Trap technology creates high-affinity product candidates formany types of signaling molecules, including growth factors and cytokines. TheTrap technology involves fusing two distinct fully human receptor componentsand a fully human immunoglobulin-G constant region. Fully Human MonoclonalAntibodies: Regeneron has developed a suite(VelociSuite) of patented technologies, including VelocImmune and VelociMab,that allow Regeneron scientists to determine the best targets for therapeuticintervention and rapidly generate high-quality, fully human antibodies drugcandidates addressing these targets. 2 Herper, Matthew (August 14, 2013). "How Two Guys From Queens Are Changing Drug Discovery". Forbes.